JOHN MONTAGU IS LORD SANDWICH. The 67-year-old is the 11th Earl of Sandwich and a member of the British House of Lords. Sandwiches as we know them were named after his great-great-great-great-great-great-grandfather, the 4th Earl of Sandwich, also named John Montagu. The Sandwiches are now in the business of selling sandwiches. Lord Sandwich opened the first Earl of Sandwich franchise in 2004 at Disneyland in Florida together with his second son, Orlando Montagu (whose older brother will eventually become the 12th Earl of Sandwich), and Hard Dock Cafe and Planet Hollywood founder Robert Earl. There are 13 sandwich shops open and 10 more under construction across the United States and Europe selling Earl of Sandwich–themed vittles like “The Full Montagu” (roasted beef, turkey, Swiss and cheddar cheese, lettuce, Roma tomato, and “Earl’s Mustard”) and “The Earl’s Grey Lemonade” (lemonade and Earl Grey tea). First, sir, would you please describe for me your version of the story of the origin of the sandwich? The Encyclopedia Britannica calls him a “profligate gambler” and says the term was coined after he spent 24 hours at a gambling table eating only sandwiches. That is an absurd explanation. 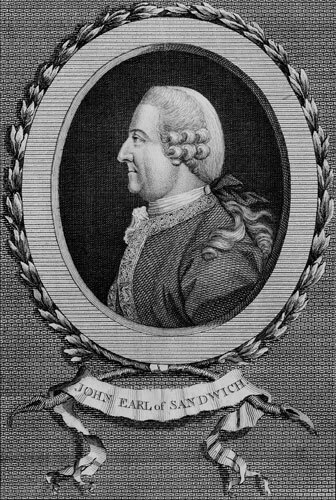 The 4th Earl of Sandwich had a distinguished public service career. He ran the British Navy. He funded the explorations of Captain James Cook. Do you ever find it strange that his legacy, and the legacy of your family title, is as the originator of the sandwich? You mean something so very trite as the sandwich? Not trite exactly, just that he had this full life but that the world remembers him for this peculiar detail about his preference for meat squeezed between bread. I think he would have been rather amused. He was that sort of person. He was a bon viveur. He had many different interests. apart from the fact that he enjoyed going out in the company of ladies and had two large families himself, he would have been amused that this is the tradition that survived all the others. He sponsored Captain James Cook’s exploration of the Hawaiian Islands, which were subsequently called the Sandwich Islands. Have you ever been to Hawaii? I’ve never been, though my father used to go often. There were a lot of different places named for the family. In Australia, there is an island off the Great Barrier Reef which carries one of the three family names, Hinchingbrooke. There’s the Montagu state in Tasmania, and there are the South Sandwich islands, as well as Hawaii. In Canada you find the name as well. It was the age of discovery, and they were using the names of the prominent men of the time. When your son Orlando first approached you about the idea of an Earl of Sandwich franchise, what was your reaction? Did you have any hesitation about capitalizing on the Sandwich family lore? The family joke has always been that if we could have a royalty on every sandwich in the world, then we’d rescue the family fortunes. We’ve got a good story. It’s pretty unique in the world. Every single small town has a sign saying sandwich. I don’t know of any other name of any family that is in that position. I think the world would expect us to have a bit of fun as a family. If it is an investment, it may also help to restore some of the valuable things that have remained in the family historically. When it was mentioned that he wanted to start a family company himself, I was very excited. It has proved to be very successful in the United States. When you see the word sandwich, which you likely see multiple times a day, do you feel a sense of ownership of the name, or have you become blind to it? I’m mostly blind to it, really. Sandwich is a title, not a name. Montagu is the family name. We think of ourselves as the Montagu family. How would you characterize the differences between American sandwiches and British sandwiches? I congratulate America for the quality of food and especially bread that I found when I went to the New York World’s Fair in 1964. The idea in England that the Americans can’t make a good sandwich is simply not the case. Here we have a tradition of railway sandwiches. When I was much younger, there was only a triangular sandwich which was served up in British railways. The bread was plastic. The ingredients were dull, and we just knew that England was not the home of sandwiches at that time. Since then, the influences have come in from France and the United States. Now you can get as good a sandwich here as you can hope to have. For the record, the House of Lords now serves a very good sandwich. I’m glad to say we can do it even in Parliament. I tend to eat the sort of sandwiches that hold together. They’re quite simple sandwiches, unlike the multistoried ones that you can get now. I’m still quite attached to the traditional beef sandwich with salad, but I eat chicken sandwiches. What’s your least favorite sandwich? Something you will never order or eat? When it becomes mixtures of fruit and cheese and meats, these are the things I’ve occasionally had to taste. Anything that is more than two or three ingredients I reject. Many of the Earl of Sandwich shops are opening in airports. Airports are notorious for bad food. Are you at all worried that their negative reputation might sully the business? MALIA WOLLAN is a Meatpaper editor and contributor to the New York Times.